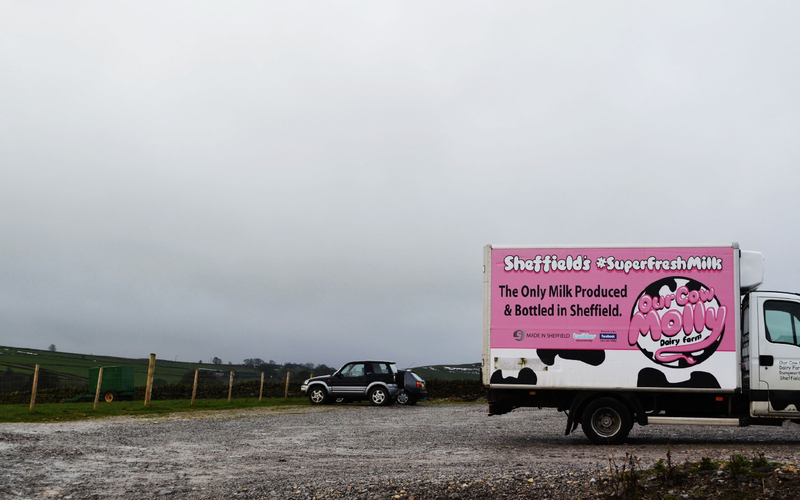 Their milk is super fresh, bottled on-site and distributed locally, while the dairy ice cream melts on the tongues of the entire Sheffield population. Ed Andrew, who now runs the Our Cow Molly farm, presents us with the many reasons for why his rural business is still thriving. “When I was little, every neighbour was a milkman, there were local farms everywhere. Now, milk is all sourced from God knows where, the traceability is completely stripped,” begins Ed, whose grandfather set up their Dungworth dairy farm in 1947. 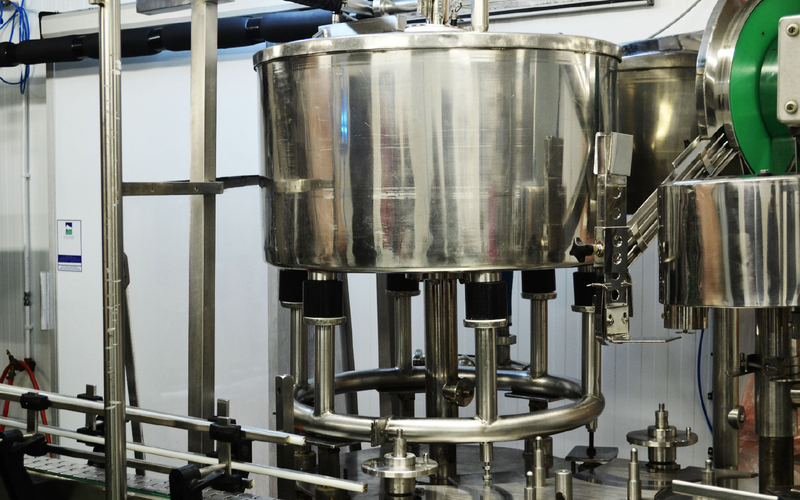 As oppose to more ‘anonymous’ milk suppliers, the unique Our Cow Molly products have plenty of history behind them. “There were only 10 cows here initially, but we’ve expanded since and now have about 90,” says Ed, as we walk into the building where the milking process takes place. Ed’s father, who’s been taking care of the animals for decades, ensures it’s not a stressful experience for them. “We play some classical music through the speakers and cool the cows down with a fan,” says Ed, who believes milking can and should be harmless – after all, nobody wants milk coming from a stressed cow. Great animal welfare is not however the only positively different thing about Our Cow Molly. As the gimmick-free motto reads, the milks’ cow-to-customer journey only takes a day, ensuring extreme freshness. “If you put your order anytime before 5 pm, you have a guarantee to get your milk the next day,” says Ed proudly. That rule applies not just to coffee shops and restaurants that use Our Cow Molly milk, but also the glass bottle doorstep deliveries that go to over 1000 households each day, keeping up with the tradition that locals still care for. “I really don’t see the hype about us, we’re just a small family farm,” says Ed, shrugging his shoulders. Customers do however, especially now, value the personal approach of local suppliers, so distant from that of industry estates. 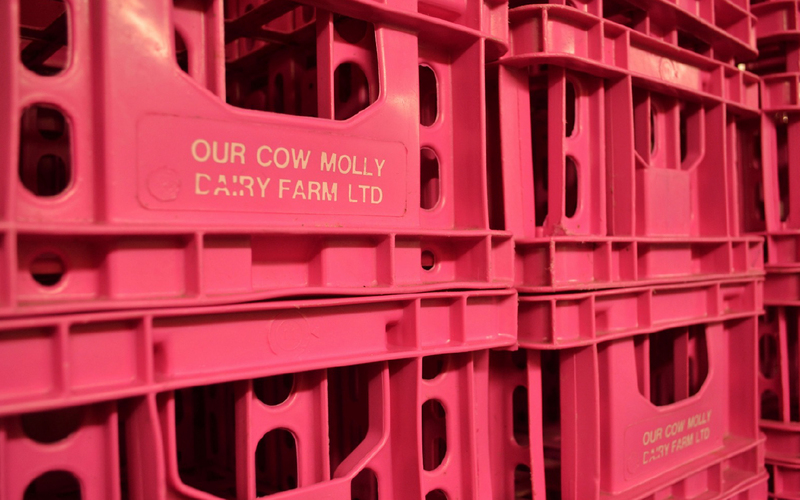 Fresh milk, rich cream and excellent butter are all loved by those, who use Our Cow Molly in their homes or businesses. But it’s the ice cream, made from what was once merely a byproduct, which receives the highest praise and is sold exclusively to retailers in the city. “All of our spare cream was sent off to a high end lipstick factory before we finally decided to make use of it,” explains Ed. However, the process wasn’t the easiest to start with. “The recipe that came with our Italian ice cream machines wouldn’t work, as our cream was simply too rich to churn,” Ed laughs. The primary ingredient was therefore not only local and fresh, but also envied by Italian gelato maestros – and that alone is saying something. All of the flavours, including the classic Vanilla or unusually delicate Mint Choc Chip, are free of artificial nonsense; seasonal flavour specials are made literally by chucking the festive cakes into the machine. “How else would you replicate the real taste?,” wonders Ed, and it’s that genuineness and common sense that has earned people’s hearts and trust above slightly higher costs. 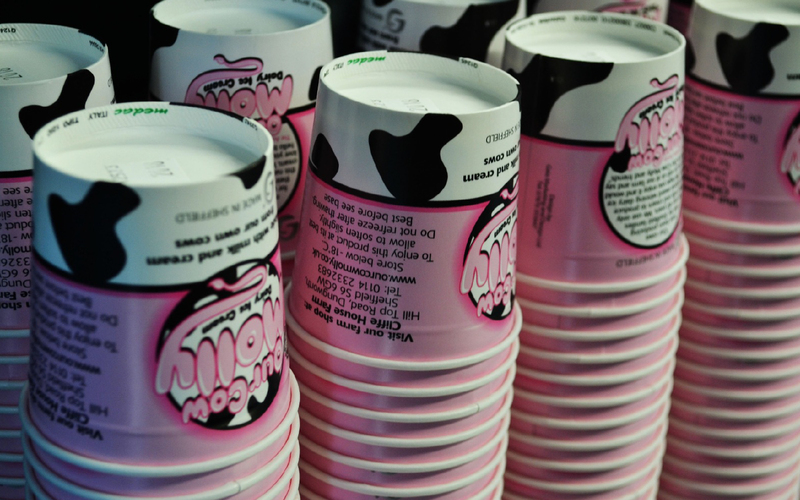 It is obvious to anyone who promotes their products – a local customer will always appreciate Our Cow Molly over simply ‘ice cream’. 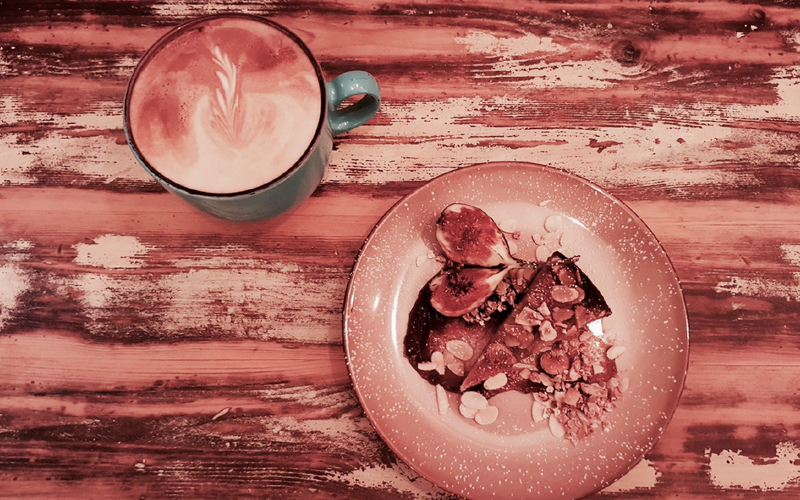 Our desserts couldn’t be the same without the company of a melting scoop, not to mention the buttery scallops, the pan fried hake fillet or perfectly texturised lattes. Our Cow Molly might be the last dairy farm left in Sheffield, producing and bottling their own milk, but they’re the only one we will ever need. 1. Pour the cream into a pan and add all the other ingredients, apart from gelatine, and bring up to a simmer. 2. In the meantime, soak the gelatine sheets. 3. Turn down the heat and add the gelatine, stirring gently until dissolved. 4. Remove the mixture from the stove and once cooled down, put in the fridge until set slightly before transferring it into individual moulds. 5. Leave in the fridge until set completely. 6. Before serving, top with berry compote and garnish with honeycomb, mint leaves and a dusting of powdered sugar. 1. Rub the flour, sugar and butter together, until they start to form ‘crumbs’. 2. Make a well in the mixture and add the eggs. Work the into the flour mixture using your fingertips, until the dough begins to hold together. 3. When the dough is well amalgamated, knead it a few times with the palm of your hand until smooth. 4. Roll the dough into a ball, wrap in cling film and rest in the fridge for 1-2 hours before using. 6. Take the pastry case out of the over and let it cool down completely. In the meantime, make the filling. 7. Heat the cream in a pan until almost boiling, be careful not to catch on the bottom. 8. Pour the hot cream onto the chocolate, orange zest and diced butter in a mixing bowl, and stir until all butter and chocolate have melted. 9. Carefully pour into the tart case until nearly at the top and allow to cool before putting in the fridge to set. 10. Once set, portion into 10 pieces and garnish with orange slices and a scoop of Our Cow Molly ice cream.